At We Buy Houses Bridgeport Chicago IL, we believe that it should be as easy as 1, 2, 3 when it comes to sell a house fast in Bridgeport Chicago IL. We will meet with you at the house and give you an AS-IS cash offer on your house. It is as simple as that! There is no obligation to sell your house to us and we will go over all of your options in a stress-free manner when we meet. We have purchased houses from families just like yours for over 10 years and know that every situation is different. Since we are buying the house AS-IS you do not need to worry about cleaning the house up before we visit. We do not mind if there is work that needs to be done since we own a construction company that can do anything to a house. We have pretty much seen it all! At the house, we will walk through the house and estimate the repairs and upgrades that are needed. After we walk through the house, we will be able to give you a cash offer so you can sell house fast Bridgeport Chicago IL. Even though Joshua Inglis has his real estate license, you will never have to pay a commission if we buy the house. Many times, we can even give you an idea of what your house would sell for if you listed it with a real estate agent, so you can compare it with our offer. Sometimes an as-is cash offer is not your best option and that is why we like to go over all your options when we meet. When we make you an offer, we use the standard offer forms that the state of Illinois recommends and the forms that your attorney is familiar with. We know that selling a house can be stressful, so we have made it as easy as possible for people to sell a house. After our initial meeting, you will not even need to go back to the house if you don’t live there and if you don’t want to go back to the house. Many of the sellers we work with live in other states and in some cases we actually never meet the sellers and the sellers never come back to the house after moving. We make it that easy to sell house fast Bridgeport Chicago IL. If there are items that have sentimental value in the house, please let us know and we can even assist you with shipping them anywhere in the world if you are not local. If you have antiques, we can connect you with an estate sale company to help you get some extra funds outside of the sale of the house. Everything else in the house can stay when you sell it to us. You do not need to take the time to clean out the house. We will donate all of the items that need a good home to places like Goodwill, Savers, Salvation Army, and other non-profits. We will also take care of everything else so you do not need to lift a finger, even if the house is filled to the ceilings with stuff (yes we have purchased houses where items were stacked to the ceiling in every room). We Buy Houses Bridgeport Chicago IL believes in making it easy for sellers and donating to local charities. We Buy Houses Bridgeport Chicago IL Illinois can likely help in almost any real estate situation but if we can’t for some reason, we can likely direct you to someone who can. Our years of experience and real estate solutions are geared for any individual. We hope that you call us toll free at 855-SELL-QWK (855-735-5795) for a no obligation offer on your house. 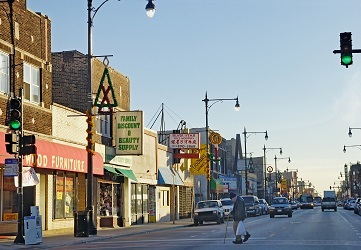 We have been a part of the Bridgeport Chicago IL area for over 10 years and are local. We hope that you Work with We Buy Houses Bridgeport Chicago IL to Sell House Fast Bridgeport Chicago IL. Please call us at 855-SELL-QWK (855-735-5795) or click the banner below for a fast, fair, free, no obligation offer on your house.